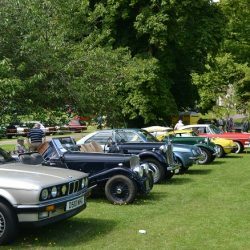 The 15th J uly will see a new event at Holker Hall in Cark in Cartmel as the Kirkby Lonsdale Motor Club stage their 18th annual classic car show – The Car’s the Star, within the historic venue’s parkland for the very first time. Previously staged at Heaves Hotel, Levens, the show will bring together displays from all eras of motoring and motorsport, from the forties right through to the present day, with classes and awards for all types of vehicles. Visitors will also be able to enjoy a great family day out with arena displays, trade stands, auto-jumble, and a variety of food and drink on offer. The show is open from 11.00am to 4.00pm on Sunday 15th July 2018. Admission £6.00 with under 16’s free. Car entries from Gareth Adams: gd.adams@tiscali.co.uk 01524298251. General show enquiries. mileswhitelock@hotmail.com 015395 60269.